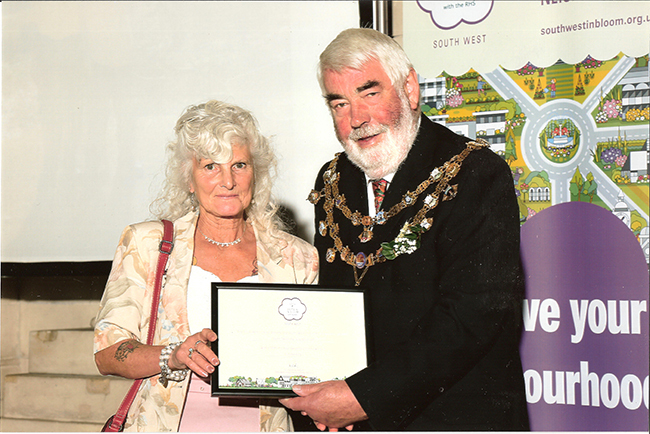 The scenic South Devon Railway ( SDR )won a prestigious ‘Outstanding’ horticultural award from the Royal Horticultural Society ( RHS ) and South West in Bloom’s ‘It’s Your Neighbourhood’ competition on the evening of Thursday 24th September. SDR Groundsman Nic Wakeling was unable to attend the ceremony, but one member of the Buckfastleigh gardens team, Barbara Parratt, was there along with several hundred other entrants in the region, and she was were delighted to receive the top accolade and certificate, especially as it’s the second year running that the SDR has won a South West in Bloom award! The SDR Buckfastleigh gardens team, who are almost all volunteers, comprises around ten local people, plus a regular group from the Passmore Edwards Centre.